Terrorism is always heinous—but it is even more abhorrent when directed against children. While every life lost is a tragedy—an entire world destroyed for the victim’s loved ones—the brutal slaying of a child –and the taking of a life, intentionally cut short, well before any perceived blame for some real or imagined injustice could be credibly assigned to it—always seems so much more senseless and heartless. Sadly, Israeli children—even infants—have regularly been the purposeful targets of Palestinian terror organizations. Indeed, the murder of Israeli children has not only been indiscriminate, but deliberate. Arguably, one of the most horrific instances of terrorist infanticide was the murder of ten-month old Shalhevet Pass, who was shot through the head by a Palestinian-Arab sniper on March 26, 2001 in Hebron, while in her stroller with her parents. Yet, with almost indescribable depravity, the Palestinian Authority‘s official radio station, the Voice of Palestine—in an attempt to distance the terror organization from the atrocity—alleged that the claims of the infant’s death by sniper fire was a lie…and that it was the girl’s mother herself who had murdered her own baby! Admittedly, collateral damage—including juveniles casualties—has always been a regrettable outcome of war, but rarely have the deliberate slaughter of children—and their perpetrators—been feted as heroes, as they are in Palestinian-Arab society. 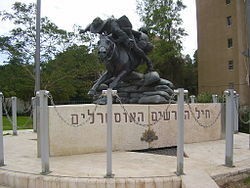 The record of Palestinian-Arab barbarity is replete with gory examples of terrorists explicitly targeting children—for example, in Kfar Chabad in 1956 where 5 children were gunned down by Palestinian terrorists; the 1974 Ma’alot massacre in the Galilee, when 22 schoolchildren were butchered; the gruesome stabbing and stoning to death of two schoolboys in Gush Etzion in 2001; the assault on the Mercaz HaRav Yeshiva in Jerusalem in 2008, where 7 young students lost their lives; and the 2014 kidnapping and murder of 3 youths in Gush Etzion—to name but a few. It is not, however, only the bloodcurdling brutality of these and other acts that should cause shock and revulsion. It is also the manner with which they are celebrated by much of the Palestinian public at large. Thus, for example the massacre at the Mercaz HaRav yeshiva was not only praised by Hamas but – according Palestinian polls—supported by 84% percent of the Palestinian population!! A monument to ‘martyr’ Khaled Nazzal in a Jenin square named after him. However, when it comes to slaughter of innocents, the conduct of the allegedly “moderate” Palestinian Authority chairman, Mahmoud Abbas, is no less appalling. Recently, Abbas has, despite vigorous protest from Israel, insisted obdurately on erecting a monument in the town of Jenin, commemorating the notorious Khaled Nazzal, mastermind of the Ma’alot massacre, in which 22 school children were cold-bloodedly murdered, when terrorists from the Democratic Front for Liberation of Palestine, opened machine gun fire and hurled grenades at them inside a school-house they had taken over in the Northern Israel. This then, is true face of the soulless inhumanity Israelis, of all ages—including the youngest of infants—face every day. It is a chilling portrait that must be driven home into the consciousness—and conscience—of the world. Previous From Israel: Divisive, Divisive! Next Ties between Māori & Israel are strengthened in Northland, New Zealand. I agree 100% that what you say here needs to be driven home into the consciousness and conscience of the whole world. The main problem, as I’m sure you’re aware Martin, is that there is no semblance of balance in world media when it comes to Israel, and the Jewish Nation is outnumbered and outgunned by something like 1000 – 1 and doesn’t get a look in. I’ve just spent the best part of an hour trawling the media for reports on the Golder’s Green event for International Children’s Day 2018 and found no non-Jewish coverage. Leaving aside the local UK Jewish press, I came up with Jews Down Under, Eye on Antisemitism, Arutz Sheva and Campaign4Truth. I’m not being critical of your good self and others involved in Jewish journalism Martin, but how do we get from a position of Preaching to the Converted, so to speak, to getting our collective voice heard out there and listened to on mainstream media?